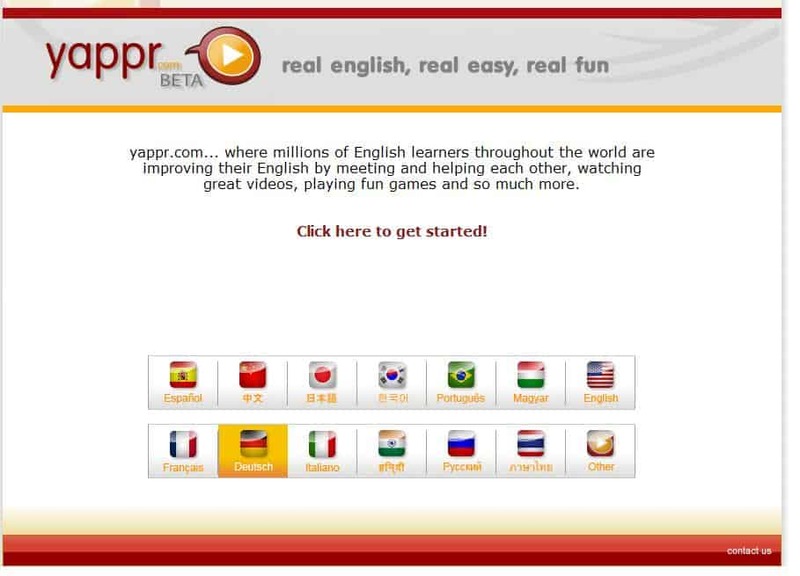 Yappr is an online community that brings users from all over the world together to improve their English language skills. It's a community driven website with a strong focus on community and social aspects. You begin by selecting your native language from 14 available ones including English itself which is probably there for native English speakers who want to contribute to the website or get better at English. Other languages include German, Japanese, Spanish, French and Chinese. Some features are only available to registered users, like participating in chat rooms or participating in discussions. Others are free for everyone which include watching English videos. That would not be different from websites like YouTube if not for the fact that any video comes with English transcription and a translated version. Registered users can edit the translation or English transcriptions if they spot errors. The usual social features are all available like friends, profile pages and points for activities. Currently videos make up the biggest part of the community but the developers have plans to integrate games and other activities to the website. To get started simply click on the videos link at the top of the website and either use the selection that is being made available or sort the videos by rating or popularity instead. Instead of doing so, you can alternatively click on one of the channels, business, politics or how to videos to name a few. The videos are day to day videos from news over commentary to cartoons and everything in between. The idea here is to provide users from all over the world with access to those videos so that they can learn English in a natural environment. The quality of the videos differs highly and what may make this even more difficult is the fact that they are not rated at all. English beginners may for instance have a tough time following some of the videos because they may be too complex for them to understand. The site features a pronunciation section, and a tools section. The tools section includes a translation, a quick pronunciation voice tool, a spell check and grammar tool, and dictionary and thesaurus search functionality. Update: The most recent version of the site divides the English classroom into different skill levels. There are classes for beginner, intermediate and advanced users, and job-specific classes on top of that. New users may take a class placement test to get suggestions based on the test result. This could be an official web partner of the LPGA!! !